/ Uncategorized / Nouvelle Tysons Corner a Candidate for USGBC LEED Project of the Year! The U.S. Green Building Council (USGBC) National Capital Region is currently accepting nominations for their Awards of Excellence event, which recognizes the best LEED projects in the region. The USGBC is seeking candidates for LEED Project of the Year in various categories, a Notable Green Project, and a People’s Choice Award — all of which will be voted upon during the event. Green Living, LLC has been asked to submit Hanover’s Nouvelle Tysons Corner. 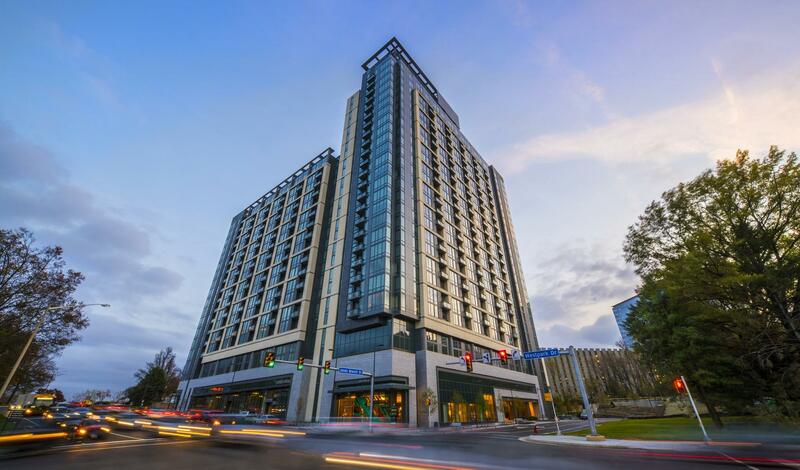 Nouvelle Tysons Corner is a multi-family residential project developed by Hanover Company. Green Living, LLC provided all of the LEED project management, building commissioning and energy modeling services that enabled Tyson’s Corner to be awarded LEED Silver Cerrification. As part of the certification, potential residents were presented a short film on the benefits brought of LEED as they relate to their residency and the quality of life in a LEED facility. This high-rise building is adjacent to a variety of established shops, restaurants, and entertainment with easy access to public transportation. Located on a property area of approximately 11.86 acres, the project includes a 22-story building with 574 units that wrap around a 5 level parking structure providing 705 parking spaces for residents. With the garage structure, the gross building area is 516,666 square feet and includes a clubhouse with a fitness center. This project has achieved LEED Silver Certification under LEED NC V2009.